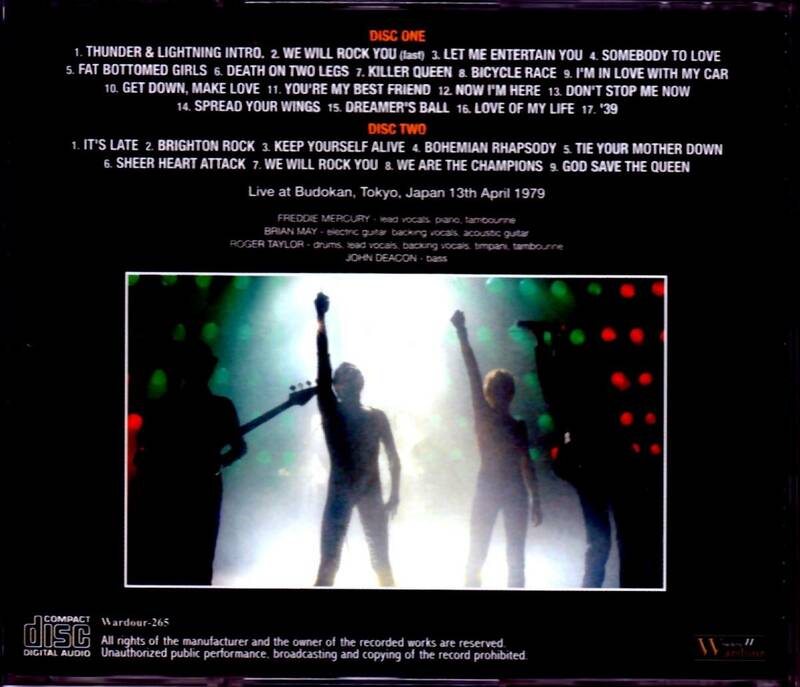 Recorded: Live at Budokan, Tokyo, Japan April 13th.1979. Comments: The first concert on this 'Jazz' tour of Japan. Queen played total 15 gigs on this Japan tour. Over all, 15 performances. 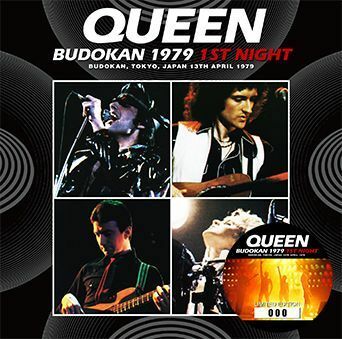 QUEEN’s big tour boasts the highest number of performances even in Japan’s history in Japan, and this work’s Nippon Budokan performance was the first day of the concert. Last year ‘s topic work “BUDOKAN 1979 2ND NIGHT” was the world’ s first appearance master, but the contents of the show itself was known by the previous episode. However, this work ‘April 13’ is not so. Although only the latter half of the show has been released, this work is a decision board live album recorded fullshow through one stroke. Such a work is a really splendid audience sound. Most recently it was released on the net and it is the master standing colored as a mania all over the world “Finally the first day in Japan was discovered!”, But it is not a shock simply by the first public release. The sound was also excellent. When you play this work, you will flinch for a moment in the slightly distorted sound at the beginning, but that is only the beginning. Improving Mirumimu, when it comes into the third song “Somebody To Love” the sound space which is perfectly stable and completely stable spreads out. There is no immediate feeling of being a “soundboard!”, But the performance and singing voice that reaches straight are fantastic and clear. And the vintage workplace feeling is really real and wonderful. What is more real than anything is the yellow fairy telling the popularity of the time. An idol scream like the end of the 70s flies from here and there. One time, like a ripple far away, at some point the inside of the hall will boil at a stroke. There is a sense of perspective and three-dimensional appearance as if every Freddie’s stroke happens to the eye. Besides, it is wonderful because it does not block music. Despite the imminent clapping, the yellow screams are far and clear musical tones are pushing through all the time. At the same time you can taste the mood of “Qian Yue Sheng” different from any country in the world with Queen of the prosperity. This work is a business that refined such exquisite master with further remaster. In our shop, we cooperate with the worldwide authority of QUEEN research supervised, but this time overseas researchers themselves mastering. His is much smaller than the netmaster, and the pitch which was randomly mad is also accurate. Of course, because he is a resident who loves QUEEN sincerely, I am deeply aware of “sound at the scene should have been this”, and the natural “ringing” that the recording itself had has also been fully utilized. Recording itself is in the middle of circling around the world, but this work is finished in “the best peak here”. The quality portrayed on that quality is the “whole picture of the first day” that no one could listen to before. As mentioned earlier, although there was also a previous departure only in the second half part, the real pleasure of fullshow recording was first experience. Nippon Budokan × Because it was two consecutive performances, “Fat Bottomed Girls” which was not “BUDOKAN 1979 2ND NIGHT” will also be played, but more than that any series of moments to hear for the first time until every single song is MC. MC on “Secondbody To Love” on the 2nd day of the Nippon Budokan has become a legend, but also on the first day, I understood that it was only “Good evening everyone, how are you” (laugh) ). What’s even wonderful is Freddy’s strong. When saying “Japan in 1979”, Freddie could caught a cold as a result of an aggressive schedule, and many days were pretty annoying. However, this work has still no problem with physical condition only on the first day. Although it was good also in “BUDOKAN 1979 2ND NIGHT”, in this work, a masterpiece will be held in which overseas enthusiasts will align with “It’s definitely Mercury’s best show of the Japanese tour !!”. Spread Your Wings is particularly wonderful. Although it was played until the Kanazawa performance, Freddie’s condition got worse and it was a masterpiece that was cut in the latter half of Japan tour. However, in this work it sings well without any problems without any problems. Moreover, the clapping gathering which participates in the performance also spreads at the venue where Freddy looks at, and it is wrapped in a wonderful sense of unity. This work is also a live album that can be entirely immersed in such inspiring air. Finally unearthed in 1979 Japan’s full day full. What was contained in it was the appearance of Freddie filled with wonderful sound and original radiance. The best version that QUEEN expert who was impressed with the new excavation finished with passion. Please enjoy this moment of excavation.